Chef Josh Hebert didn’t set out to open one of the best ramen shops in Scottsdale. 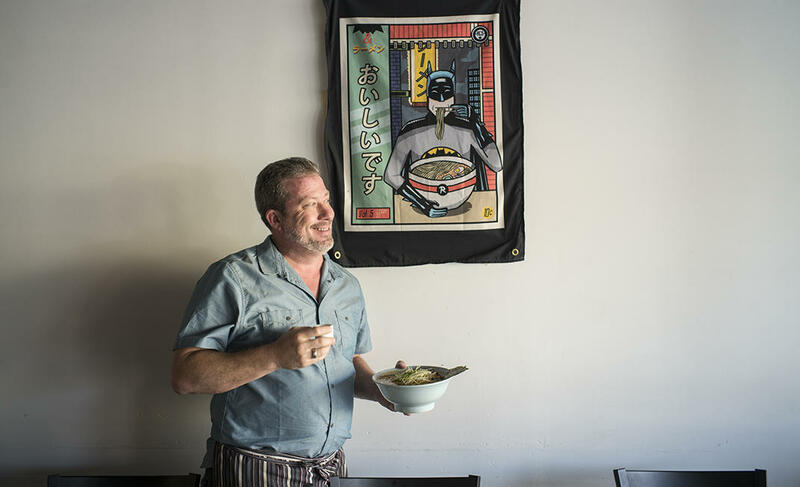 But when you love something, you want to share it, which why this self-proclaimed gaijin, or foreigner, became one of the Valley’s best ambassador’s for Japanese ramen. And it’s true—or at least that’s the short version of the story of how Hebert ended up closing POSH, his fine dining restaurant in downtown Scottsdale, and focusing all his energy on Hot Noodles Cold Sake, a fast-casual ramen shop in a North Scottsdale strip mall. The long version of the story goes back to Japan, where Hebert spent a year living, working, cooking…and falling in love with ramen. Of course, it wasn’t just any bowl of noodles that sparked the obsession, but a specific bowl of goma, or sesame-flavored ramen, he used to eat at a ramen shop in the Gotanda neighborhood of Tokyo. When Hebert came back to the states, he wanted to recreate the goma ramen, not for his POSH diners so much as for himself. Once word got out to other Japanese cuisine enthusiasts that the POSH chef was making authentic ramen after hours, he opened the restaurant as a late-night “pop up” ramen shop. 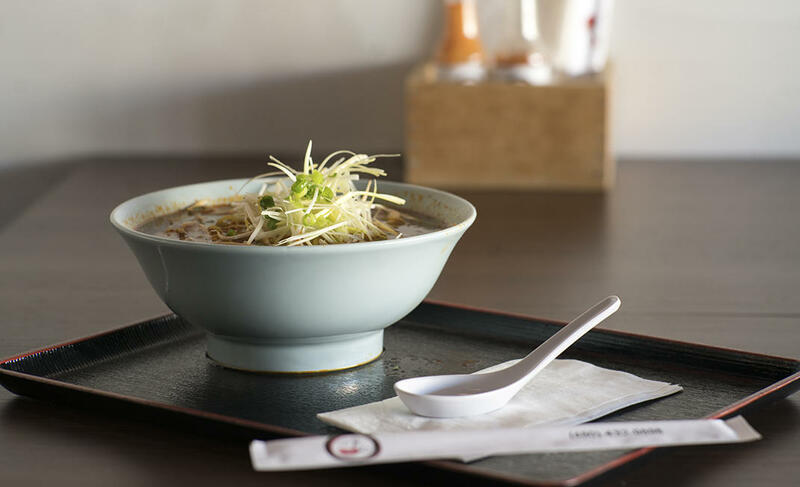 The goma ramen in particular, made with char-sui pork fat and sesame paste, has since become something of Hebert’s specialty. When the one-off ramen nights became a smash hit, he made them a weekly affair, during which the upscale restaurant would transform into a sort of Japanese restaurant/speakeasy. That was in 2014 and continued until the opening of Hot Noodles Cold Sake in fall 2016. Unlike at POSH, it’s all about the ramen at Hot Noodles Cold Sake, though the menu also includes a few appetizers to round things out. And though it’s a simple menu, Hebert and his culinary team still stick to using high-quality ingredients and the tedious, traditional cooking methods that make the ramen unlike anything else in town. But it’s not just the dedication to craftsmanship that makes Hot Noodles Cold Sake stand out. The restaurant has also taken creative license with traditional ramen, with exceptional success. “We’re trying to flex with the idea of the blue plate special,” Hebert says, which is why on Tuesday nights you can order a bowl of Taco Ramen featuring a taco meat flavor-infused broth and topped al pastor-style meat. On Saturday, you’ll even find sigsig on the menu, a Filipino dish made with chopped pig’s head (one of the chefs at the restaurant used to own a Filipino food truck). Naturally, the grilled pork can also be served atop, you guessed it, a piping hot bowl of ramen. But you don’t have to be open to pork cheek to give Hot Noodles Cold Sake a try. 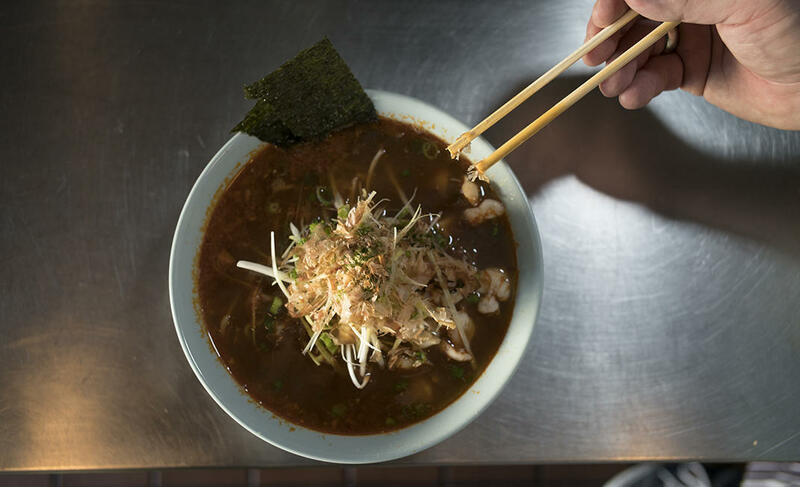 The restaurant’s menu also offers more familiar options including shoyu and miso flavored ramen topped with traditional garnishes such as nori, bonito, leeks, bean sprouts, scallions. Hebert says first-time diners are often pleasantly surprised by how light and fresh this ramen tastes.